Japanese love cheese. That is why cheese is popular as a light meal, an afternoon snack, or munchies with drinks. Just as there are snacks that emphasize the cheese flavor, there are also ones with only a trace of cheesy taste. 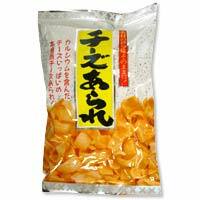 You could say that this Cheese Arare snack is the typical representative of the latter.